The other day, my friend and co-worker Diane asked what time I was headed to the break room for lunch. It was a nice surprise to have Diane sit with me and my regular lunch date, Rebecah, as she rarely leaves her desk. After heating our leftovers in the microwave, Rebecah and I sat and Diane joined us shortly thereafter. She was carrying a large shopping bag with a box inside. Diane’s daughter is heading off to college soon, so I assumed she was carrying a gift for her. Lunch rolled along, and I thought nothing of Diane putting her box on the table. There was a hand-made card taped to the top of the box. I could see Rebecah smiling in agreement and suddenly realized Diane was giving something to me. “Just read it!” Rebecah chimed in. I started to connect the dots with the photo of a hand-mirror on the box and her card. I knew there was a mirror inside, but I couldn’t open the box right away – and I couldn’t hold back. My hands covered my face and I just started crying. Diane knows my insecurities with my face – my history with my skin. She knows about my recent visit to the surgeon and how deflated I was when he spoke with me about making a huge difference with my skin. She also read my post about wishing someone would invent a talking mirror – where the mirror would provide positive affirmations. After wiping my eyeliner clean, I opened the box. 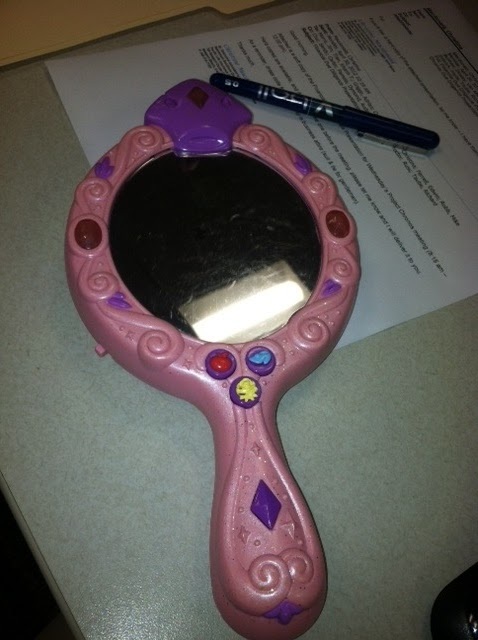 Not only was my gift a mirror – it was a beautiful, pretty-in-pink, Disney Princess Magic Talking Mirror! Diane pressed a pink button as I held up the mirror and a little voice told me how beautiful I was. We all started laughing. After hugs and thank yous, I walked back to my office, still in awe of the thoughtfulness of my friend – just wanting me to see myself as she does – as others do. It made me wonder if we all need little reminders from time to time to see ourselves how we really are, past our flaws, to the core of our hearts. One of my closest friends has a scar around on her right temple, next to her eye. I’ve never known her to be anything but beautiful – made up or fresh faced. She radiates beauty from within, and although I do see her scar, it’s part of who she is, and I don’t see anything ugly about it. This is what you call a Light Bulb Moment. The fact Diane went to such lengths to tell me I am beautiful – scars and all, made me think about how I feel about my friend with her scar. It also reminded me to think about my own flaws that way. Sometimes lessons come in the most creative ways. Sometimes life throws us lessons so powerful we need to take a moment. Last night Kevin and I were watching a documentary on the Discovery Health channel about man with facial tumors covering more than half his face. It was fascinating and heartbreaking to watch the interview. I’ve never seen anything like it: massive tumors taking over the landscape of someone’s face. 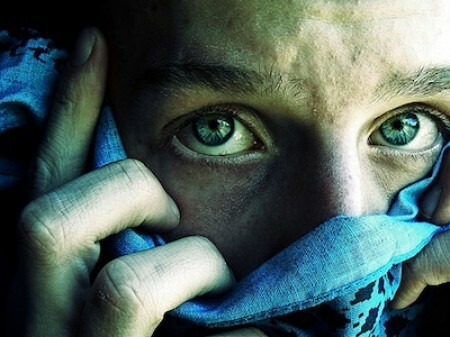 One of his eyes looked like it was welded shut and his mouth was so distorted it looked like it was painful to speak. As doctors worked on removing the tumors, I started to cry. It made me think of the countless surgeries I’ve had on my skin and how I felt each time the bandages came off. How my scars would never be completely removed. Watching this man’s face bandaged up as he looked in the mirror was moving on so many levels. The end result was less than perfect but he was so grateful and happy with the results. The documentary continued as his wife and children were interviewed. My first thought was wow – he was able to accept his flaws and find love. His dynamic personality was also impressive. I was in awe. If you’ve ever watched The Real Housewives’ of Beverly Hills or Orange County (where I live) and thought some of the women were a little over the top – you aren’t alone. It’s an amusing thing to live so close to people who think beauty equates to money, a certain dress size or how much Botox you have. Not everyone is caught in the Beauty-Trap here, but you will find women like that in these neighborhoods. And then you have this man. This man who embraces his life and feels grateful for his family and health. He jokes with his daughter about being on a Top 100 Most Handsome Man list. He knows what real beauty is and through his interview, reminded me of it too. After the show, I looked at Kevin and wiped tears from my cheeks. We all must live with the cards we were dealt. Why not embrace our differences and learn to accept one another as unique beauties in our own right? Thanks to this documentary, I am learning to do that just a little more. So tell me: what is your definition of beauty?